Keep up with today's rapid advances in the biological sciences with ANIMAL PHYSIOLOGY: FROM GENES TO ORGANISMS 2E with CourseMate! 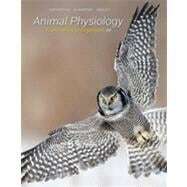 With coverage of animal species that will be relevant to your animal-related career, this biology text provides you with the tools you need to succeed. Boxes found throughout the text such as Molecular Biology and Genomics, Beyond the Basics, Challenges and Controversies, Unanswered Questions, and A Closer Look at Adaptation give you examples of cutting-edge research and help you see how what you are learning applies to the real world. Check Your Understanding questions after each major section help you review the main ideas as you read. Each chapter then ends with a Chapter Summary, a set of Review, Synthesize, and Analyze questions, and a list of Suggested Readings for further study.